Three of Pentacles finds a small group of people involved in a meeting of some kind. There are three people. They stand close to a stone building that has all the appearances of a church. The young man standing on the bench appears to have been busy chiseling away on the stonework of this building before the other two figures arrived. He may have been expecting them or perhaps they just dropped by to check how the work was proceeding. One of the other figures appears to hold the plans of the building the young man is working on and we may assume that he is the architect of this fine structure. The third figure is that of a monk so let us presume that it is he who has commissioned the build and hired those with the necessary knowledge, skills and qualifications to carry out the work. In the Three of Pentacles we explore the nature of the Group and how we work within groups who have common goals or purpose to achieve our aims. This card deals with the importance of teamwork and its contribution in successfully reaching goals and completing projects on time. Individually the figures are very capable and able within their own field of expertise. However, they need each other’s expertise to complete the project they are working on. The Monk, being a man of the cloth knows what he wants for his church. He also has a budget that he must operate within. Like his religious and spiritual beliefs, his church must stand the test of time and be able to withstand anything that threatens its stability. The Monk has hired the expertise of an architect who will draw up the necessary plans based on his requirements. The architect will explain to the monk what is possible and what is not and provide several drafts before anything is finally settled upon. Once the plans have been officially signed off, they must then find the right builders and specialized tradesmen to provide them with the finished product as per specifications. The church must also be built within a certain time frame and come in on budget. It will take the cooperation of all within this group to achieve such a lofty ambition. All must be committed to the task. All must give it their very best and work to the highest standards possible. And what of their reward for such focused effort? With this being a Pentacle card material gain is extremely important so all will expect to be handsomely paid for their time. However, the Three of Pentacles deals with more than just an honest day’s pay for an h0nest day’s work. Recognition for their work is also extremely important. The Monk will expect to be praised for his wonderful church and thanked by his entire congregation for providing them with such a special and holy place to worship in. The congregation in turn will expect recognition for all their generous ongoing donations which have gone a long way to funding the building itself. Both the architect and builder will expect to gain further commissions and work once word gets around and others see this fine building. The architect and specialized tradesmen may even be hoping for an award so this card also deals with the importance of quality in our work and how it reflects our personality and reputation as a result. Churches by tradition are considered holy, sacred and spiritual. They were built to last on sound and solid foundations. The traditional churches of old showcased amazing feats of engineering, craftsmanship and artistry. An incredible amount of fine detail and passion went into these massive structures. As a result, they often took a long, long time to build. Great patience, commitment and endurance were demanded of all. The individual stones had to be cut from quarries and hauled over miles of terrain before one wall could be built. Statues and symbolic spiritual images and lettering had to be painstakingly carved and chiseled out of the stone. Specialized paintwork and magnificent stained glass depictions took months if not years to complete. Then there was all the precious metal work and carpentry to complete. No rush-jobs, shoddy workmanship or impatience are ever seen in these ancient buildings. All who worked on them felt proud and privileged to be part of something considered so worthy for these buildings were understood to be the House of God and therefore only their very best effort would do. The reversed 3 of Pentacles is generally a positive card, particularly with regard to work and career questions, but it carries the warning that this is not the time to allow yourself to slack off. Work is very much a focus when the 3 of Pentacles reversed is in the picture. It’s an important time to give your best, not settle for the simplest solution. If you do, you are likely to find yourself with much success. Provided you don’t suddenly start producing lousy or inferior work, you should find that you are more successful in the “marketplace” when the reversed 3 of Pentacles is in the spread. Do not allow yourself to give in to any feelings of jealousy or pettiness. Take the higher road. In a love question, the reversed 3 of Pentacles is a good omen. If you are looking to add to your family, this is a time when fertility can be higher than usual. If you’re looking for love, this is a good time to meet people (particularly through your work) however, beware a tendency to be overly subservient or to behave as though you are “less than” the potential love partners you are meeting. Hold your head up high! Money should be going well (or be about to go well for you) when the reversed 3 of Pentacles is part of your spread. However, you need to not just expect “pennies from heaven.” How well you do financially will be in direct proportion to how hard you have worked and how much you have tried. Don’t grovel, but do ask for what you deserve. When it comes to your health, you should be cautious about over-doing things. Moderation is the key when the reversed 3 of Pentacles appears. Trust your instincts. If you are feeling weak, rest. If you think you need to be seen by a doctor, then don’t hesitate. You may be overly tired when this card appears in Reverse. The reversed 3 can indicate that you are indeed ready to make a spiritual leap; however, you should be cautious about where and from whom you accept input. You already have a number of the answers that you need deep within you, and you may be in a phase where it is easy to be “blinded” by a guru who claims to have your best interests at heart but who may truly be more interested in your money. Be extremely cautious with new spiritual leaders and churches, and cautious about where you put your money in that regard. Spiritual growth is FREE. When the Three of Pentacles reverses it suggests there are reasons why you are not getting things off the ground or making progress in your situation. Regardless of what you say you are not putting any real effort into your work or the task at hand. You must ask yourself why this is? On the front you are all talk and full of plans but nothing is getting done. This could be down to a lack of commitment or belief in what you are doing. It could simply be that you are getting no joy out of it and it all seems like too much work. It could also be as a result of fear. Do you think that you haven’t got what it takes to be a success? Do you fear losing everything if your plans fail? Could you possibly have taken on too much? Negativity may be eating away at you and preventing any positive growth. Impatience and lack of concentration is evident as you fail to apply yourself to your work. The Three of Pentacles Reversed speaks of rushed jobs and taking short-cuts. There appears to be a lack of pride in what you do and a careless attitude about you. All you want to do is get the job done and move on so your heart is really not in this at all. Intense boredom may be an issue or just plain laziness. In the Upright card the young builder was busying chiseling away when the monk and architect came on site. He was so intent and focused on his work that he didn’t even stop to put his tools down for he wanted to get stuck back in as soon as they left. In the reversed, there is more of a chance that he was taking yet another break when he saw the two arrive and very quickly had to make it appear that he had been hard at it all day. He has neither respect for himself nor the people who are relying on him to complete the build. He is only in it for the money and will be long gone before any of his botched jobs come to light. If you are involved in building your own house or buying a property the Reversed Three of Pentacles can unfortunately suggest a building survey that fails. Subsidence or structural problems may be an issue. Plans need to be checked in detail as there may be mistakes discovered. You may be enthusiastic to do as much of the work as you can but do you really know what you are doing? Try to get as much advice as you can and allow some of the budget for the essentials such as plumbing and wiring. Get the best builders you can afford as this reversed card can represent cheap builders who lack quality and qualifications. Double-check credentials and references of all builders for they may not be trust worthy. You get what you pay for and you may live to regret it. It can represent problems getting a build complete due to builders not turning up or knocking off early. Either be a constant on-site presence or hire a reliable Project Manager to make sure the job gets done on time and that work is completed to regulation and standards. Scrimping here may cause expensive problems down the line. If builders are asking for money up front then this reversed card would strongly advise against it. Make sure the price agreed on is based on a certain completion date otherwise it may drag on indefinitely. Sadly, with the reversed Three of Pentacles, shoddy workmanship and poor finish is likely to be problem. Cowboy builders with lack of skill and interest are highlighted. The reversed Three of Pentacles can often highlight delays in getting work done or reaching goals due to a problem with a group of people who cannot cooperate or join forces. A lack of positive teamwork can raise issues of superiority, pulling rank or possessiveness about the project. You may feel that all your efforts are in vain. No matter what you do, your work it is criticized, picked at or dismissed. You may feel that you do not receive the recognition you deserve or that others take the credit for you work. This is not a group who work well together as there may be too many chiefs and not enough Indians. They are the wrong people for the job. On the other hand you find it impossible to take constructive criticism or advice from your superiors. You may also try to muddle through a situation as you refuse to seek expert advice. You may view it as an expense you cannot afford or that it would not be worth the time and effort. You may be completely out of your depth but you continue to plough on regardless. All you are doing is digging a deeper hole for yourself and penny pinching now may cost you dearly in the long run. 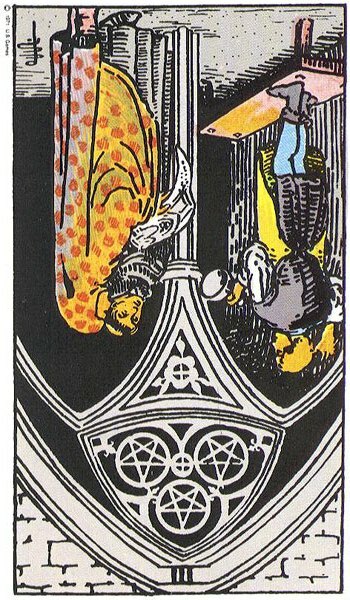 The Three of Pentacles Reversed is a flag or warning that you do not know what you are doing. You haven’t thought things through properly and have no real plans to work by. You may be making it up as you go along. You need to do more research into your situation as you still have a lot to learn. Slow down and take stock of the situation. You might need to do a course or gain some extra qualifications. This reversed card questions your education or lack of it and can be a sign that you are under qualified or unskilled. Don’t pretend to be someone you are not. If you want success then you will have to work hard for it. Set long-term goals for yourself and work towards them. It is the only way as there are no shortcuts. However, you have to show some determination and commitment if you are ever going to make it. However, ambition may not be one of your strongest qualities. In The reversed Three of Pentacles we find the student who is not applying himself to his studies. This is usually the student who has not had to work hard to pay for his college fees or contribute towards them. It also represents the student who has no interest in the field he or she is studying in. This can be for a variety of reasons. The student may have been uncertain of what course to take and now realizes he or she has made a mistake or it can represent the son or daughter who embarks upon a course of study chosen for them by parents or dictated by family tradition. This is bound to reflect in their work as lack of quality and poor grades. We may also find the college drop-out when this card reverses especially if a reversed Page of Pentacles appears in the Spread. A change of college, course of study or an alternative career may be the simple solution to up righting this card again. The student needs to sit down and carefully decide on what it is they want to do with their life before committing to anything else. Otherwise a negative pattern of failed ventures can set in. The upright Three of Pentacles suggests learning, learning and more learning in order to promote growth and development. When it reverses it can often indicate the inability to learn and especially the inability to learn from past mistakes which keep repeating over and over again. In relationships this reversed card can be a sign that no effort is being put in to making it work. It indicates a lack of commitment and growth within the relationship. You or your partner may not be able to sustain initial efforts and good intentions fall by the wayside over time. It can suggest that it is not the first time relationships have gone this way for you as patterns of behavior repeat themselves. You may ignore advice to seek counseling from well meaning friend’s family preferring instead to work it out your way. However, your way has never worked in the past. There is a definite lack of solid foundations within the relationship represented by this Reversed Three. One must ask the question as to why the couple were drawn to each other in the first place (may not be the stuff solid relationships are built on). Are you continuing to drift from one meaningless relationship to the next? What are you learning from all this? It may have been discovered that you oversold yourself to get a job. Your work lacks quality and is really not up to much. You may lose your job if you don’t sort yourself out. Time to shape up or ship out. Job problems and possible boredom on the job front. If you are making a presentation it may not go well. Have you put in the necessary work? Lack of success in job interviews as what you have to offer is mediocre at best. The reversed Three of Pentacles can indicate a lack of teamwork, whereby people are acting in competition with each other and trying to appear the most knowledgeable. You may be trying to work collaboratively with others but there is an increasing level of tension as each individual tries to exert power or control over the group, thus negatively impacting the harmony of the people involved. If you rely on the cooperation of others, now may be a good time to break free of your current group or network and join forces with another group. The lack of harmony and teamwork is having a negative impact on your performance and there may be a lack of a common goal. It may be best to just move on at this stage. The Three of Pentacles reversed signifies that you are seeking more respect in the workplace. You have had to be polite and listen to the opinions and feedback of your superiors but now you seem to be growing restless with always taking the advice, rather than giving it. You want to work in an environment where you have the chance to voice your own opinion and be heard, where you are seen as the expert or the leader. You may also be seeking new colleagues who bring with them new knowledge, so as to create a more synergistic team environment. The Three of Pentacles reversed can also indicate that you are working in a fairly mundane job, in which your contributions and experience are not really appreciated or valued. There is not much opportunity for growth and advancement, and you feel as if your skills and capabilities are not being effectively utilized. It may be a good time to make a career move and find somewhere where your skills are more valued. Given the upright Three of Pentacles is about good planning and organization, the reversal of this card can suggest that you are need to bring more of this energy into your work. If you do not have a clear view of how you will accomplish your goals, then it will be beneficial to stop work momentarily and plan out your next steps at a detailed level.